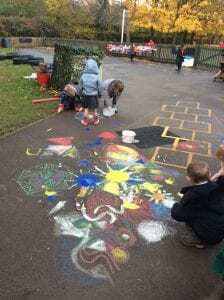 Reception celebrated Diwali by creating Rangoli Patterns by our door, using chalk and paint. We discovered that this was done as a way to welcome the God Lakshmi into buildings. 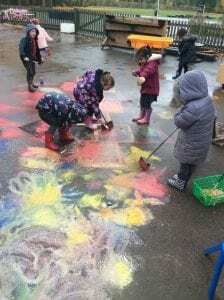 It was really fun once the colours started to blend together in the rain! We also acted out the story of Rama and Sita, and made Diwali cards.